Covington City Hall is located at 638 Madison Avenue, Covington, KY 41011; phone: 859-292-2160. Photo: Daniel Carter Beard House, ca. 1850, 322 East Third Street, Covington, KY. This was the boyhood home of Daniel Carter Beard, one of the key figures in the movement that led to the founding of the Boy Scouts of America in 1910. A National Historic Landmark, listed on the National Register of Historic Places in 1966. 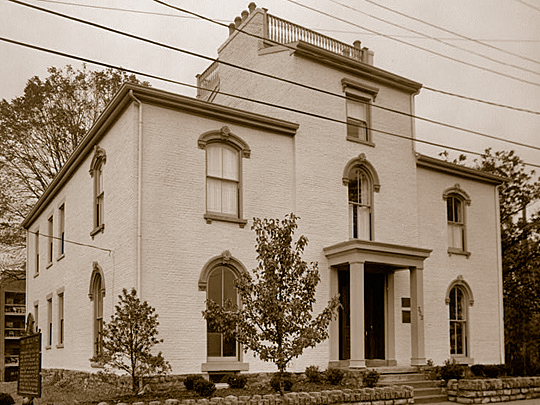 Historic American Buildings Survey [HABS KY-164], memory.loc.gov, accessed January, 2012. Gilford Photography, photographed in October, 1985. Covington was initially platted in 1816, when a group of developers purchased 160 acres from Thomas Kennedy, platted the city south from the Ohio River to Sixth Street and west from the Licking River to Washington Street, and began selling lots at public auction. The investors, John and Richard Gano and Thomas Carneal, named the city after General Leonard Covington, who was killed during the War of 1812. The city was an early speculative venture, with investors interested in capitalizing on the growing metropolis of Cincinnati, founded in 1788, and located on the Ohio River directly opposite Covington. At this time, most of the lots in the original plat of Covington had been developed, and the city continued to grow. Covington clearly profited from its proximity to Cincinnati. In the 1830s, Cincinnati was one of the fastest growing cities in the United States, and Covington benefitted from this growth. By 1640, Covington had more than 2,000 residents, many of whom had relocated from Pennsylvania, Virginia and Maryland. [†] In response to this increase in population, Covington's city fathers began to consider expanding the city to the west and the south. In 1841, Covington annexed land to the west as far as Willow Run Creek and to the south as far as 12th Street. Before the decade was out, Covington would expand even further south. † Thomason, Phillip. Covington, Kentucky Eastside Multiple Resource Area National Register Nomination. Nashville: Thomason and Associates, 1986. Leah Lonicki, consultant, Moser Family Houses, Kenton County, KY, nomination document, 2000, National Park Service, National Register of Historic Places, Washington, D.C.